At the invitation of the Beethovenfest, the ICMA Jury held its General Assembly 2019 in Bonn. 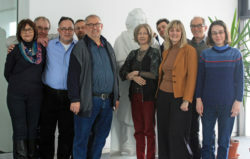 While discussing current topics of ICMA and preparing the next Award Ceremonies, the Jurymembers also learned about the plans for the Beethoven Year 2020. They notably met intendant Nike Wagner (in our photo, in the middle) to get more information about the Beethovenfest.